This magazine (more like a mini-book) is a must have for enthusiasts! It's quite extensive. There are a lot of good lookin Corollas in here! 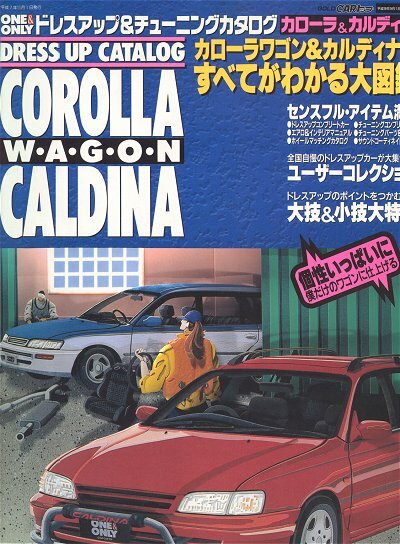 Although it focuses on the Corolla wagon, most parts are still compatible with the sedan. Apparently, the Japanese did not dismiss this car after all! I would scan every page of this thing, but that would violate copyright laws, and it would also take up A LOT of space (not to mention that it would ruin my only copy). You might even consider just performing a web search. You might be able to locate other distributors. Volume 18 in Hyper Rev's great line. Each Hyper Rev volume is devoted to a specific car (or set of cars). 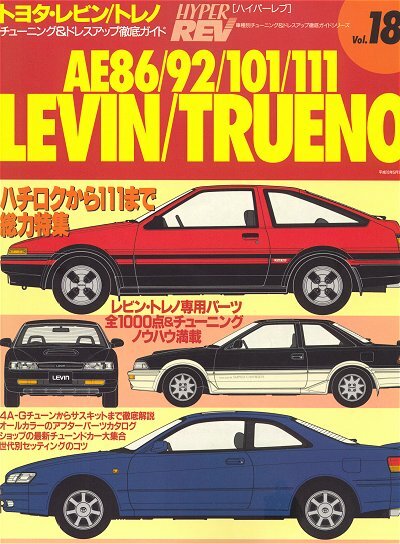 As you can tell from the cover, this one is all about the AE86/92/101/111. It doesn't cover the AE102 specifically, but certain parts are compatible...besides it's all Toyota, it's all good. Lots of great pictures and information. Contains a "product catalog" conveniently categorized in sections such as Aero Parts, Brake Parts, Stability, Wheel Matching, etc. A must have for any Toyota enthusiast. This AE86 video by Best Motoring (Video Special Vol. 42) is awesome! I hear Vol. 41 (also about the Hachiroku) is great too. I have one good copy on hand and more should be on their way from Japan through Kinokuniya. 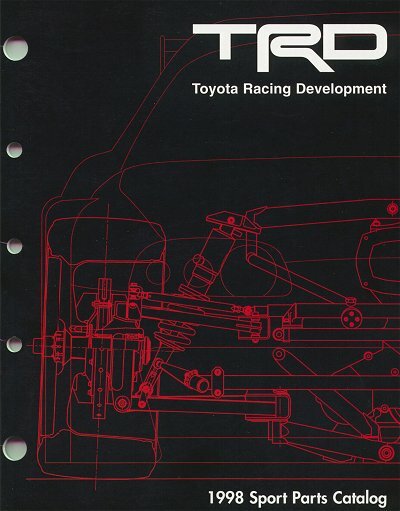 TRD-USA's 1998 Sport Parts Catalog. 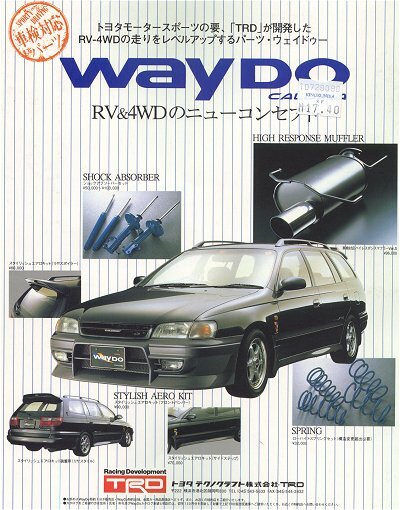 There's not too much in here, but what Toyota enthusiast is complete without yet one more catalog? =) Order either by calling TRD or by filling out the online catalog request form on their website which is linked from Toyota's main website. I'm not sure if the catalog is free or if it costs $5...I get it for free. Parts can be ordered directly from TRD or through your local Toyota dealership's parts department. 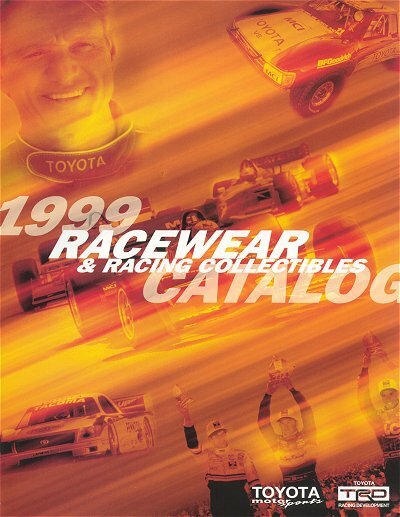 The 1999 Racewear & Racing Collectibles catalog. If you like flaunting your TRD pride (like me), you might consider purchasing some items from here...from shirts to jackets to beach blankets and stickers and clocks, oh my. Interesting stuff. Items in here aren't actually carried by TRD. They are distributed by HA-LO Marketing. They can be reached at 888-274-6452. This comprehensive ASE certified textbook is great for those wanting to increase their automotive knowledge and for pros needing a little brush-up. Covers just about everything from fundamental principles to service and repair. Some topics aren't covered in as much detail as I'd like, however. An accompanying workbook and instructor's guide are also available for purchase. Costs about $100 from Toyota Service Publications. Contact them at 1-800-622-2033, or 750 W. Victoria St., Compton, CA 90220-5538. It's probably easier to obtain it from your local Toyota dealer's parts department. The available manuals are: Vehicle Repair, Electrical Systems, Automatic Transmission/Transaxle Overhaul, replacement Owner's Manual. Very extensive and detailed...and thick. A must have! Not quite as extensive and detailed as the official Toyota repair manual but much cheaper. I own both, of course. 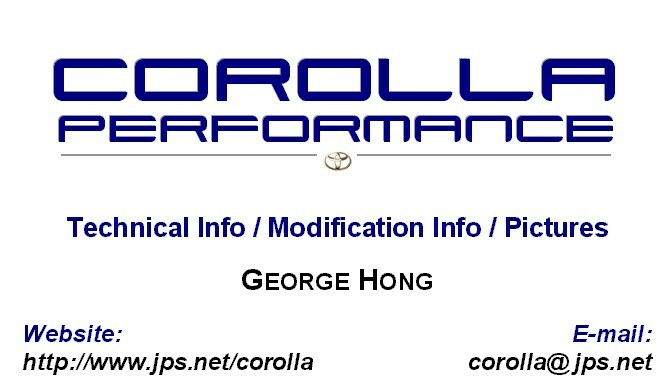 =) However, the information presented is very useful, and unlike the Toyota manual, is much more straightforward and procedure-oriented...and has good photos. IMO, the Haynes manuals are much better for general work. 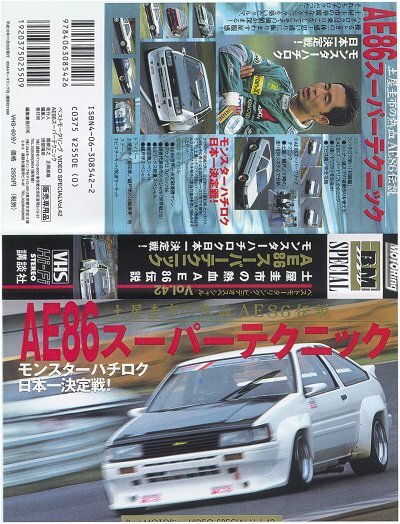 Note that Haynes does NOT have a manual for the AE86 GT-S.